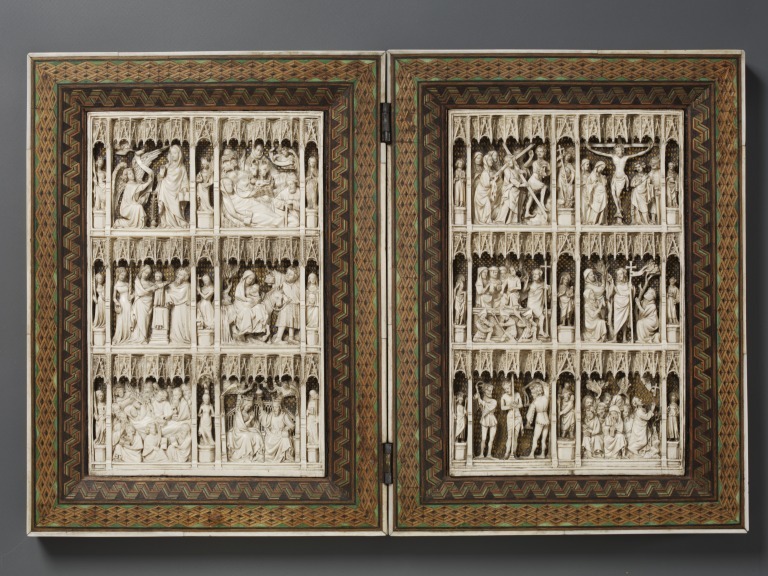 This is a diptych with scenes of the Life of Christ in ivory and a case with a lid in cut and punched leather. The Diptych is from France, Paris or North Italy, probably Milan, while the case with lid is from France. The wood case is decorated with the arms of Boucher d'Orsay on one side and Raguier on the other, and would therefore appear to refer to Bureau Boucher and Gillette Raguier, who married in 1414. Bureau Boucher (d. 1461) was Lord of Piscop and Orsay (Essonne), First Counsellor to Parliament (1414/15-17) and Counsellor to Charles VI, and held other high offices; Gillette Raguier (d. 1481), was the daughter of Remon Raguier, also a Lord of Orsay. A closely comparable case, with the arms of Philip the Bold of Burgundy (1363-1404) was made for an ivory Annunciation group, probably of 1400, now in the Musée d'Art et Histoire Guy-Baillet in Langres. 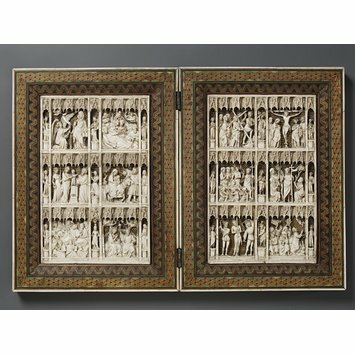 The devotional diptych is in many ways the object type most associated with the notion of Gothic ivory carving. The earliest examples probably date to the 1240s; these are complex, large and ambitious works that emerged, somewhat surprisingly, with no obvious precursors. The owners of ivory diptychs sometimes appear within their images. Such portraits indicate that they were special requests on the part of their commissioners, and they parallel the similar figures that appear in manuscripts and panel paintings of the period. The iconography of Gothic diptychs oscillated between two poles. The first of which is the desire to present narratives (Life of Christ and Virgin Mary) for envisaging. The second was the use of non-narrative images to form the focus of devotion. Each wing has a single large pierced ivory relief with six scenes under elaborate canopies. At the sides and in the middle are narrow upright compartments with individual figures of saints standing on pedestals within niches. On the left wing are the Annunciation, the Nativity, the Presentation in the Temple, the Flight into Egypt, the Death of the Virgin and the Glorification of the Virgin. The standing saints, all female, from top left to bottom right, are St Agnes, St Catherine, St Mary Magdalene, St Barbara, St Margaret, St Veronica, St Apollonia, St Agatha, and St Clare. On the right wing are the Carrying of the Cross, the Crucifixion, the Resurrection and the Maries at the Sepulchre, Christ appearing to the Maries, the Flagellation and the Agony in the Garden; the standing saints, all male, from top left to bottom right, are St Lawrence, St Michael, St Nicasius, St Denis, St John the Baptist, St Stephan, St Louis, St Christopher and St Francis of Assisi. The reliefs are unpainted but are set off with backgrounds of painted vellum in imitation of contemporary manuscript illuminations, consisting of lozenges and squares in gold, black, dark blue and red. In the collection of Frédéric Spitzer, Paris, by 1890. Bought by George Salting in 1893 (Spitzer sale Paris - 27 April 1893, no. 116, pl. IV); George Salting collection. Bequeathed to the V&A by Salting in 1910.